An arrest warrant has been issued for a Metro Vancouver man accused of knowingly exposing his workers to asbestos without protection. The B.C. Court of Appeal ruled this week that Arthur Moore is in contempt of court for continuing to operate his asbestos and drywall removal business in the fall of 2010 despite a court order that he stop doing such work. His business operated in Surrey and other cities under the name AM Environmental, Tri City Hazmat, Surrey Hazmat, Pro Scan Environmental and other names. The appeal court upheld a lower court ruling that Moore was violating an injunction, did not provide proper safety training or equipment to his workers and was posing a significant risk to public safety. The court also said Moore was exploiting young recovering addicts as part of his work force. WorkSafeBC, which brought the legal action against Moore after finding safety concerns on his work sites, says it will seek jail time for him. Evidence presented in the Supreme Court case included an instruction Moore gave his young workers to “run” if WorkSafeBC inspectors visited a job site. One worker, David Cooper, said in an affidavit that he worked for Moore for nearly two years at dozens of demolition sites and was given only gloves as protective equipment except on one occasion. Cooper said he was never told about the health threats posed by asbestos. The court also heard that most of Moore’s workers were under 18, some as young as 14. 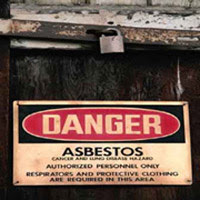 Asbestos and asbestos related diseases; Asbestos is a silent killer and there is a lot of controversy whether to ban asbestos use in country or not. Most of the developed nations have either banned or restricted the use, of asbestos. However in India, it is still used mainly in the cement industry. India is still very vulnerable country for its communicable occupational health diseases. As more than half of country’s population work as labor, the major occupational morbidities and diseases of concern in India are silicosis, muscular-skeletal injuries, coal workers’ pneumoconiosis, chronic obstructive lung diseases, asbestosis, byssinosis, pesticide poisoning and noise induced hearing loss. We all no doubt remember the rushing cloud of whitish dust which ballooned out over southern Manhattan on the morning of September 11, 2001, as the iconic towers of the World Trade Centre fell in on themselves after the planes commandeered by terrorists crashed into them. In addition to the almost 3000 people who died in the towers themselves, dozens of rescue workers and others caught in the cloud have since died from exposure to the dust. Many others developed serious lung problems which have severely affected their health and which will invariably shorten their lives. That cloud was a toxic mixture of all the materials contained in those towering structures - gypsum wallboard, floor and ceiling tiles, disintegrated concrete, shredded paper, furniture, carpets and draperies, office chemicals, metal residue, even food blown to bits in the devastation and, saddest of all, people and their clothing. 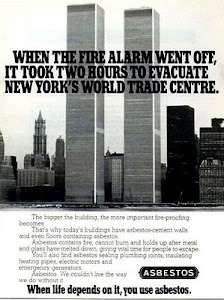 Perhaps most crucial was the 400 tonnes of asbestos, used as a fire-retardant. Asbestos is a family of minerals known to mankind for more than 4500 years. It is fibrous in form and doesn't burn. In ancient Greece, they used it to make wicks for oil lamps, funeral shrouds and ceremonial tablecloths. Asbestos came into its own during the industrial revolution, when engineers harnessed its fire-proof, heat-resisting and insulating properties in their new steam-driven factories. Asbestos covered hot pipes, was woven into steam packing and drive belts, lined furnaces and was compressed into pads used in brakes and clutches. Between the two world wars, its applications expanded widely in office buildings, schools, factories and elsewhere. In the cold countries it insulated hot water pipes feeding radiators, was put into walls and ceilings as insulation - both for heat and sound - and sprayed onto structural members as a barrier against fire. It found its way into electrical installations and domestic appliances. Until the 1980s houses were full of products containing asbestos - roofing shingles and underlay, exterior siding, insulation for pipes and boilers, caulking, wallboard, decorative plaster, stucco, acoustic ceiling tiles, vinyl floor tiles, appliance wiring and heat-resisting pads for ironing boards and hair dryers and even clay pottery. But today, asbestos has fallen out of fashion in many parts of the world, since it has been proven time and again that in addition to its many desirable properties, it is a serious health hazard. People who have been exposed over many years develop illnesses caused by the extremely tiny fibres. These fibres are several times thinner than a human hair, are practically indestructible and lodge themselves in the lining of the lung. Lungs can handle inhaled matter quite well if the particles or fibres are relatively large. Tiny hairs lining the upper parts of the lungs whip back and forth to sweep this contamination up into the throat where it can be spat out. But tiny fibres such as asbestos find their way deep into the lungs, and in any case are far too small to be swept out by the defence mechanism. As they lodge in the lining, the body reacts by encasing each tiny fibre in a pocket. This walling-in process eventually ends up thickening the lung lining and severely restricting its capacity to transfer oxygen and carbon dioxide between the blood and air, a condition called asbestosis. Suffering is the apt description of what this does to a person. Normal activity like walking across the room is a monumental effort, leaving the person gasping after a mere few steps. The use of oxygen supplied through a small plastic tube directly to the nose eases the discomfort and prolongs the victim's life, which now amounts to a life sentence. The worst of the asbestos-caused afflictions is mesothelioma, a cancer of the lung and chest cavity. In this case the fibres react chemically with the body, acting as a carcinogen and actually altering the structure of the affected cells. Again, the patient is condemned to years of pain, discomfort and death. All this became clear about a half-century ago when miners began complaining of lung problems and coughed up blood. Workers at companies which made products containing asbestos began filing complaints and claims. At first the companies fought back, challenging the merits of the complaints and throwing up a barrage of counter-measures. But as the years went by, study after study bore out the validity of the claims and contributed to the understanding of the seriousness of the various diseases asbestos inflicts on human beings. Nowadays, asbestos is banned or severely restricted in several countries. In Canada, for example, a contractor renovating an older building who finds asbestos in the walls, ceilings or heating system, has to report this to the relevant environment authorities who then send in a special team to remove the product. They seal the area in a plastic cocoon and workers wearing sealed space suits remove all the stuffing, pack it away carefully in sealed bags which are then caefuly disposed of, completely wash down the entire area and don't return it to the contractor until the air has been found to be totally free of asbestos fibres. These countries have introduced stringent regulations on the use of asbestos and in many cases ban it altogether. Many countries are now campaigning to have asbestos added to an international treaty on dangerous substances known as the Rotterdam Convention. This convention requires a country which wants to export a prohibited product to secure permission from the importing country. In this connection, Canada has come out as a bad guy. The area in the province of Quebec known as the Eastern Townships has been the focus of asbestos mining in Canada since the 1870s. Asbestos mining is centred in the town of Thetford Mines, and there is another town actually called Asbestos, which is the site of the Jeffrey Mine, until recently the world's largest source of asbestos. Asbestos was good for the region until its dangers were confirmed. And while it's almost impossible in Canada these days to find any application in which asbestos is used, the prime minister, Stephen Harper, is foremost in supporting asbestos mining and export. In this he's being aided and abetted by an Indian-born tycoon, Baljit Chadha, who is putting together a bid to take over the Jeffrey Mine. Last year India bought more than half the 135,000 tonnes of asbestos Canada produced, but it is there that Chadha is facing some of his fiercest opposition. He and others in the Canadian asbestos business argue that chrysotile - the curly fibrous form of the mineral produced in Quebec and known as white asbestos - is much safer than the crumbly type called amphibole once used in insulation. Chrysotile is used in India to make asbestos cement roofing and water pipes. Proponents argue that this binds the mineral and renders it stable, and Chadha says it provides an inexpensive building material to India's poorest and neediest. He adds that independent health inspectors will monitor the material's customers, but those who oppose asbestos say it's difficult to track asbestos products and poor safety standards can render any safeguards meaningless. Prime Minister Harper, who is known for his stubbornness, is determined to block any effort to add chrysotile to the Rotterdam Convention, putting Canada in the company of such environmentally conscious giants as Russia, Kazakhstan, Zimbabwe and China. During the election campaign earlier this year Harper visited the town of Asbestos - population a mere 7000 - twice to reinforce his support of the industry. Environmental and health groups opposed to use of the product condemn his stance. Christian Simard, executive director of Nature Québec, says, "Public policy should be based on science, not on politics," while Kathleen Ruff, senior human rights adviser to the Rideau Institute, says "Canada is becoming known as an immoral asbestos pusher and as an enemy of global public health... This is not the role Canadians want to play in the world." Hyderabad Industries, a C. K. Birla Group company, is expanding its business architecture by transforming itself from an asbestos cement (AC) roofing sheet products manufacturer to an innovative building materials and solutions provider. 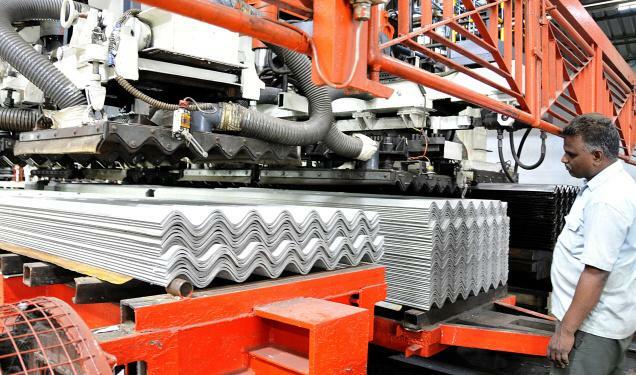 Even while expanding its AC sheet manufacturing capacity, the company is sharpening focus on creating a domestic market for non-asbestos based building products, including tiles, walls and ceiling. It is also expanding its flat product line involving cement-based products that are suitable to replace plywood in certain building products. As the first step, it has initiated trading in certain products such as mineral-fibre based ceiling tiles, steel roof sheeting products and AAC blocks. “At present we are sourcing these products primarily from China and Europe. Soon we will expand our portfolio of such products by sourcing them from Korea and Taiwan,” Mr Abhaya Shankar, Managing Director, told Business Line. To further consolidate this stream of business, HIL will be looking at setting up manufacturing facilities for these new products. “The market response so far is encouraging. We may begin to manufacture some of these products locally in two years, while other products could take about four years,” he said. HIL, as part of this strategy, is open to acquiring or having joint ventures with companies that have strengths in this sector. “We have recently decided to be open for such buys or tie-ups with suitable overseas companies too,” he added. Does this mean that the company sees an early end to asbestos-based products life cycle? “No. India will still require asbestos cement ceilings in the rural housing segment due to its cost and other advantages. Still, 50 per cent of our rural population live under thatched roofs,” Mr Shankar said. HIL, which has 12 production lines in nine plants across India, is adding one more line at its UP plant at a cost of about Rs 50 crore, which is expected to be ready by January next year. India, which imports 4 lakh tonnes of chrysotile (asbestos fibre) to produce about 4 million tonnes of AC roofing sheet, will be adding new capacities, with at least six new plants coming up in the next one to two years. Even as National Human Rights Commission awaits reply of Chief Secretary, Government of Rajasthan, the proposal of Asbestos Cement Sheets (1,08,000 TPA) manufacturing unit at # A-190 to A-193, A-196 & A-197, RIICO Industrial Area, P.S. Bagru, Tehsil Sanganer, District Jaipur in Rajasthan by M/s Bajrang Wire Products (India) Pvt. Limited came before Union Environment Ministry's EXPERT APPRAISAL COMMITTEE (INDUSTRY-1) considered it during 24th - 25th October for giving TORs to it. Aren't Canadian & Indian Governments Subservient to Asbestos Companies? Who is responsible for these asbestos-related diseases? Or is it ultimately the responsibility of Asian governments to enforce better protection of their workers and citizens? Should Canadian companies be allowed to export a disease-causing product which is legal in Asian countries? Leah Nielsen responded with a short video of Bruce Bradshaw, a coworker of her dad’s in the late 60’s and early 70’s. Her father died of mesothelioma. Bruce now has it. He spoke at our walk on October 1, 2011 in Sarnia, Ontario. He received a standing ovation. 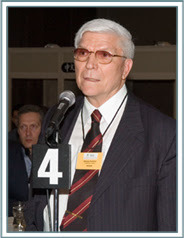 Dr Barry Castleman, author of "Asbestos: Medical and Legal Aspects" responds: Canada is the central point of the global asbestos struggle. The propaganda used by the regional asbestos industry groups was all developed by Canada, which was the world’s largest exporter of asbestos as recently as the 1990s. Canada’s leading presence among the asbestos exporting countries confers a patina of credibility that Russia, Kazakhstan, and smaller asbestos exporters simply do not have. And that is why undisclosed regional members of the global Asbestos Mafia want to keep Canada in the asbestos business, wrapping the Canadian flag around the asbestos business and using the government of Canada to legitimize their predatory business. As someone very much involved in public health work on asbestos for the past 40 years, I regard Canada as a crucially important country where we must win if we are to fulfill the World Health Organization goal of banning asbestos globally. If the national government of Canada goes on supporting the asbestos trade and the Quebec taxpayers are hit up for a $58 million subsidy to re-open a large mine in Quebec for another 25 years, it will be a disaster for public health, worldwide. The world depends on the Canadian people to stop this crime against humanity, and we are at the point where the battle in Canada will be won or lost in the next days or weeks, months at the longest. This dialogue is extremely timely given the October 1, 2011 deadline set by the Quebec Government regarding its decision to make a $58 million gift (they call it a loan guarantee) to Mr. Chadha’s asbestos consortium. As luck would have it, the publication this week of a scientific paper in Thorax, a peer-reviewed medical journal, totally demolishes the asbestos industry’s propaganda regarding the supposed safe use of asbestos. Chrysotile asbestos is what Chadha proposes to mine in Quebec and ship to India and other Asian countries. If Canadian workers refuse to work with it, why should workers in India, Indonesia and the Philippines do so? The arguments put forward by Mr. Chadha are either intentionally misleading or demonstrate a willful ignorance of the risks of exposure to chrysotile. All forms of asbestos, including chrysotile, cause asbestos-related diseases, the most prominent of which are mesothelioma, lung cancer and asbestosis. There may be a relatively lower risk of mesothelioma from exposure to chrysotile compared to other forms of asbestos, but it is disingenuous to argue that there is no risk. To emphasize the relative risk of mesothelioma, and then imply that there is no risk for lung cancer and asbestosis from chrysotile is deceitful. The risk of lung cancer and asbestosis from exposure to chrysotile is on par with other forms of asbestos. It is for that reason that rules and regulations governing the use and handling of asbestos in Canada (and other countries) do not make a distinction between the different forms of asbestos. Occupational safety and health provisions that apply to amphiboles also apply to chrysotile. If amphiboles “cannot be used safely, so they are no longer mined anywhere in the world,” there is a logical conclusion that can be drawn regarding chrysotile that is obviously at odds with Mr. Chadha’s opinion. Controlled use in developing countries is expected to “not present risks of any significance to public and/or worker health.” Despite provincial and federal rules and regulations on use that have been in place for decades, asbestos-related diseases continue to make a significant contribution to the morbidity and mortality of Canadians. Using mesothelioma as an indicator of the ineffectiveness of a controlled use strategy, the annual incidence in Canada has steadily risen since the 1970s. A report in the Canadian Medical Association Journal in 2008 highlighted the increase in incidence from 153 cases in 1984 to 344 cases in 2003. The Canadian Cancer Statistics 2011 report that came out in May 2011 indicates that the number of new cases of mesothelioma in 2007 was 514. Without provincial and federal rules and regulations, to the degree to which they are applied and enforced, the situation in Canada would be worse. It is naive at best to believe that controlled use will be effective in limiting the negative impact of chrysotile on public and worker health in developing countries. Gopal Krishna, Ban Asbestos Network of India responded: We urge you take cognizance of the newly released documents reveal that back in 2006 the Canadian government had rejected advice from Health Canada that asbestos be added to the UN list of hazardous substances. It is high time APFC advised Canadian government to pay heed to advice from Health Canada to act against a hazardous substance due to which billions of dollars are being spent over the next 20 years to remove asbestos from the Canadian Parliament Buildings because it’s a cancer-causing substance. 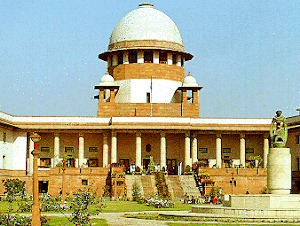 Supreme Court of India too has taken note of the fact that Canada mines and ships the majority of its asbestos to countries like India ignoring sharp increase in mortality and morbidity at present and in the decades ahead. APFC ought to consider its influence over Mr Baljit S Chadha if any to persuade him to stop promoting production and trade in chrysotile asbestos, if he fails to act, we earnestly request you to disassociate APFC from Mr Chadha as it brings the Foundation into disrepute. Anti-asbestos activists in Malaysia and Canada say a global asbestos lobby group has hired the Washington based APCO Worldwide public relations company to persuade the Malaysian government not to ban chrysotile asbestos. APCO Worldwide was hired by the Philip Morris tobacco company in the early 1990s to set up a group called The Advancement of Sound Science Coalition, after the U.S. Environmental Protection Agency classified secondhand smoke as a known human carcinogen. The coalition's mission was to dismiss concern about second-hand smoke as "junk science," and to fight anti-smoking regulations. Kathleen Ruff, an anti-asbestos activist and human rights adviser with the Ottawa-based Rideau Institute, sent a letter to APCO Worldwide president Margery Kraus on Thursday, demanding the company inform the government of Malaysia that it was hired by the International Chrysotile Association. She said APCO brought Dr. David Bernstein, a Switzerland-based toxicologist who has produced studies on smoking funded by the tobacco industry as well as studies on chrysotile asbestos funded by the asbestos industry, to Malaysia to persuade the government the product can be used safely. 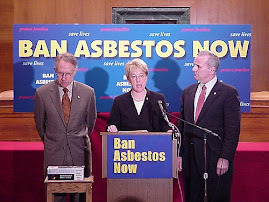 "The scientific consensus is clear - just as it is on tobacco - that all forms of asbestos, including chrysotile asbestos, cause mesothelioma, lung cancer, other cancers and asbestosis and that safe use is not possible," Ruff writes in her letter to Kraus. "Only lobby organizations that have a financial interest in selling asbestos claim that asbestos can be safely used, just as the lobby organizations acting on behalf of the tobacco industry have denied the clear science on tobacco harm." Krauss was unavailable for comment Thursday, an assistant at her Washington office said. Elizabeth Wolf, APCO's senior associate in corporate relations, declined to comment in an email message, saying: "APCO does not comment on client work as a matter of company policy." A spokesperson for Baljit Chadha of Balcorp Ltd., the lead proponent of the Jeffrey Mine expansion, said the comparison to the tobacco lobby is unmerited. "Frankly it is an unfair comparison because there is no socio-economic benefit to the tobacco industry, whereas asbestos sheets are used to build housing in the Third World," John Aylen said. "Both products (tobacco and asbestos) are carcinogens and everybody admits that, but safe handling of asbestos does not present a risk along the supply chain or to the end user." Clément Godbout, who heads the Montreal-based Chrysotile Institute and is listed in Quebec's corporation registry as the first administrator of the International Chrysotile Association, said he sees nothing wrong with an industry lobby group, for tobacco or asbestos, making its case to a government considering a ban of its product. "Of course we are concerned about the international campaign to ban chrysotile, especially in Quebec, and of course we have an association that is making efforts to convince governments not to embark on a ban," he said, adding he would "not be surprised" if the ICA had hired APCO to talk to the Malaysian government. "We are not going to just let one side continue to present its arguments. We will take our turn to dissect the message to ensure they hear the whole story. Nobody is saying (asbestos) has no problems and you can put it in your coffee and drink it, but we say it can be used safely."